This piece first appeared as the preface to Paintings and Drawings by William Roberts R.A. (London, 1976); the present text is that reprinted as 'Commentary' in William Roberts, Five Posthumous Essays and Other Writings (Valencia, 1990). © The Estate of John David Roberts. Reproduced with the permission of the William Roberts Society. 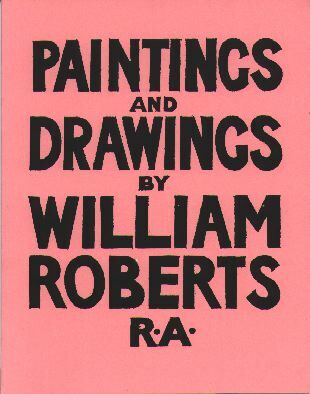 The cover of Paintings and Drawings by William Roberts R.A. The two paintings The Gypsies, and The Punters are the earliest of this collection of pictures, they were painted in Oxford about 1943. With the exception of the drawing The Guitar Lesson, all the rest have been shown at different Summer exhibitions at the Royal Academy from 1964 to 1975. The man holding a playing card is a self-portrait; for The Guitar Player, The Reader, Woman with Locket and the Recorder Player, my wife was the model. The drawing entitled On the Wire is not taken from my own First World War artillery experiences in Flanders, but from a little book by George Coppard: With a Machine Gun to Cambrai. His description of the dead Tommies hanging on the barbed wire of No-Mans-Land, some kneeling as if in prayer, was the starting point for my drawing. The Vaulting Horse painting was suggested from watching a number of Gendarmes at vaulting practice in the open air, one evening, on the quay, beside the Seine, close by Notre Dame; like true French gourmets, they stopped their leaping abruptly, when a police van arrived with their evening meal. The swimming pool drawing, although not an 'Abstract' may need explaining, it shows an instructor teaching a girl the arm movements of the 'Crawl' stroke, not in the water, but beside the pool; this drawing is one of several suggested by my swim practice at the Prince of Wales baths; a place where Sickert also liked to do his swimming. The remainder of these reproductions  differing in this from 'Abstracts'  require no explanations. However with the fashionable non-realistic painting, the explanations and analysis, of the artist's work, have become far more important than the painted Abstracts themselves, this gives the art critics the opportunity to develop their own jargon and abstruse aesthetic theories freely. Thus the word 'Figurative' has been employed in recent years by the producers of Abstracts to denote the realistic type of picture, and when used in this way, carries a subtle tinge of disparagement, which serves to enhance the quality of the Non-Figurative work, even if it is merely a simple chess-board pattern. Yet, the artist who tells no more of his life and times, than a collection of abstract designs might as well never have been born. One hears it said sometimes of an artist, that he is the victim of a 'Conspiracy of Silence', which means that the critics and reviewers, avoid mentioning him or his work, in their newspapers or periodicals; but often the 'Silence' on the part of these reviewers, can be more helpful to the victim, than the writer's printed opinions. The confusion of contradictory judgments and criticisms emitted on the Radio and TV together with that of the ever increasing army of art gallery curators, sub-curators, investigators, and researchers, not omitting of course, the crowd of art journalists and newspaper reporters; makes, from the artist's point of view, this 'Silence', conspiratorial or otherwise, something most desirable.